SEARCH IN THIS BLOG SITE; TYPE A WORD! The best thing to note is that this Long Term Course is offered for both +1 Board as well as +2 Board. iii) Our Nice answer tips for each test to show how to write for centum. iv) Tips for your improvement. If you are unable to solve a problem, you can get step by step solution. Procedures in the prospectus. TARGET CENTUM itself is enough! However, Even if you undergo tuitions/ coachings anywhere else, enrol TARGET CENTUM to safely score above the crucial Cut-Off marks. If you are going to write +2 in March-2020, you can join now for LONG TERM Course. If you need more details, Call 96 88 33 22 33 (or) 93451 55444 for a customised advice for you and fees details. 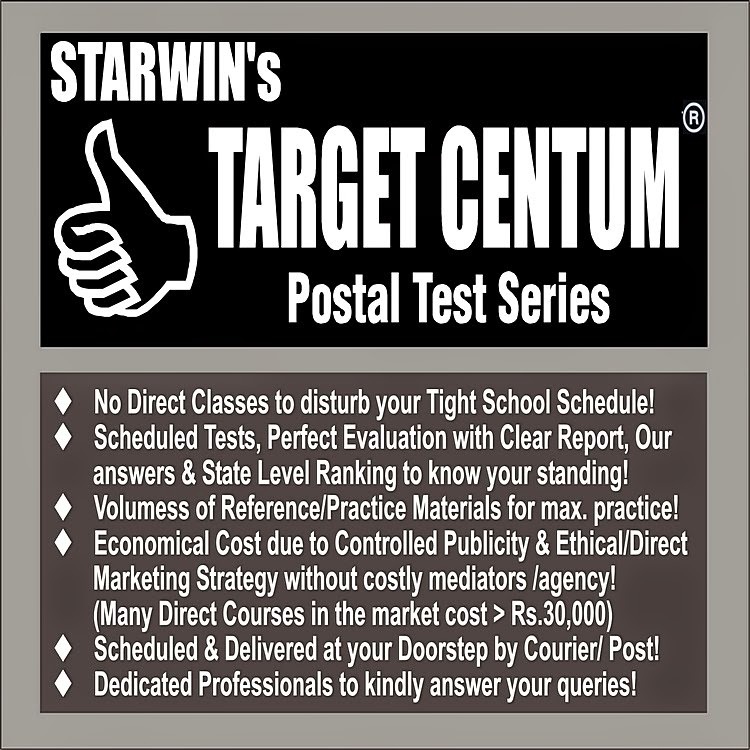 Or, send your Name, Clear address, Mobile No., Your Present Class, Name of the Exam you are going to write, Year of the exam & Class to director.starwin@gmail.com . We will send Free Prospectus by courier. You can also use the contact form given in this blog site itself. You can also visit this site: www.starwin.in , in which we have contact forms to send Course Enquiries or Enrolment Form, Payment Gateways to make Online Payments, etc. Have you already got our Printed Prospectus & Enrolment Form for your desired course? (or) Do you feel that the details given in this website are convincing? Then, easily enrol in our courses through online mode itself by clicking here and using this e-form for Enrolment. HOW TO READ A CHAPTER?